Our beautiful new Australian Bush Flower Essences Pastel Bliss pendant is a unique, exquisite, individually hand blown art pieces. It is created with loving care from medical grade glass, which makes it incredibly strong and sturdy. 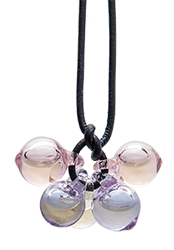 It is made with 2 light pink, 2 light purple and 1 clear bauble pendants clustered together. It comes with a high quality dark blue leather cord. A metal chain is not recommended.